With Frances Elkins as my guide. 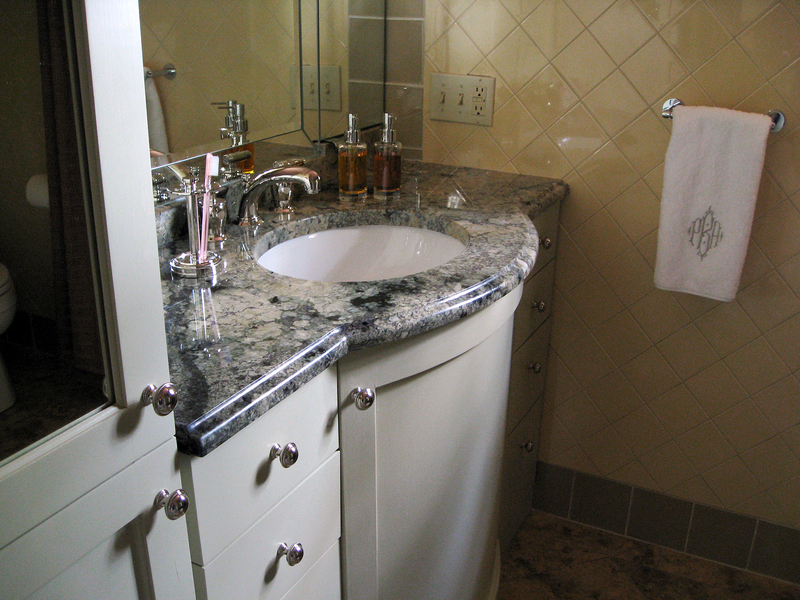 From the shaped granite-topped vanity to the inset with the Queen Anne-style mirror, her influence dictated the most important elements of my bath and dressing room. All were drawn from the book Frances Elkins: Interior Design by Stephen M. Salny, with the exception of one. My inspirations are illustrated in the following photos. 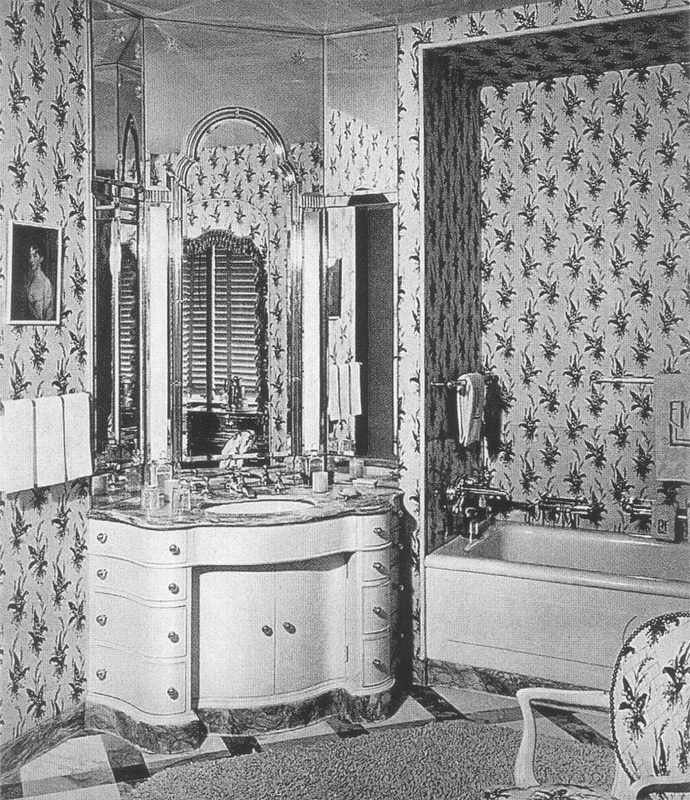 (above) This ornately shaped vanity, from the book ‘David Adler, Architect: The Elements of Style‘ is in the bathroom of the Mrs. Evelyn Marshall Field House, called Easton. 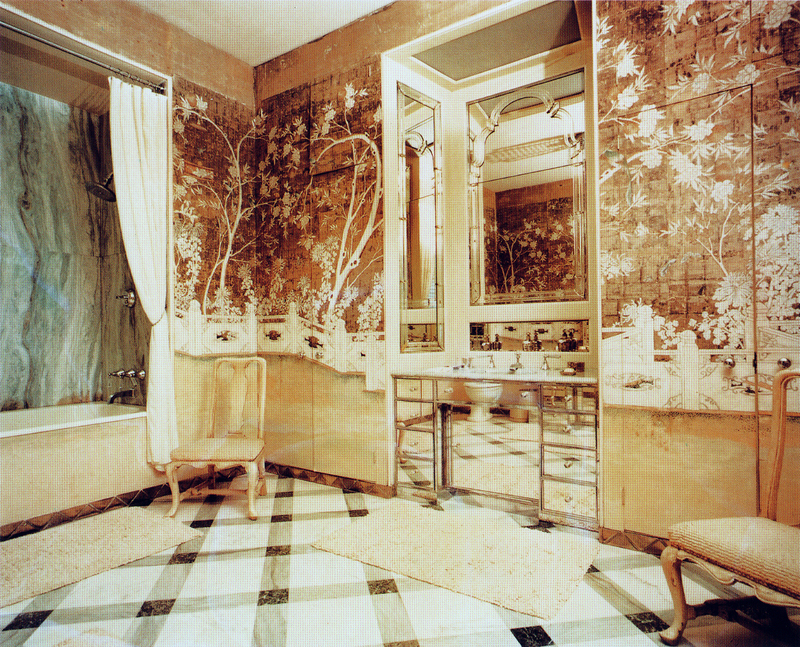 David’s sister, Frances Elkins, partnered with him on the interiors. Nobody seems to know where he left off and where she began. The Queen Anne-Venetian-style mirror is an often repeated feature used in her designs. (above) The Mr. and Mrs. Kersey Coates Reed house is another partnership between brother and sister. This is the famous Ivory Bedroom’s bathroom. The recessed vanity is the lead I took from this photo. And again, note the Queen Anne-Venetian-style mirror. 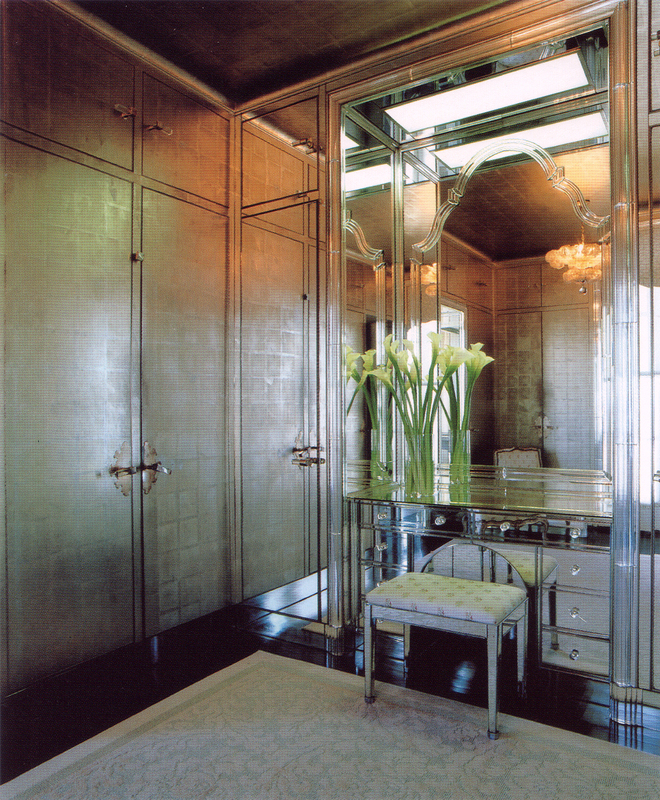 (above) This jaw-dropping-dressing room is from the Mr. and Mrs. James D. Zellerbach house. 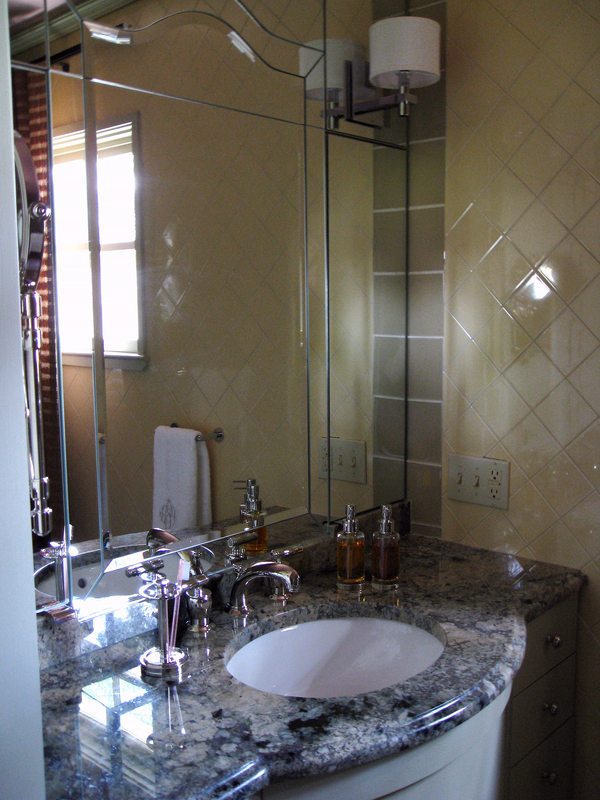 This room and the bathroom were bathed in tones ranging from sepia to silver. 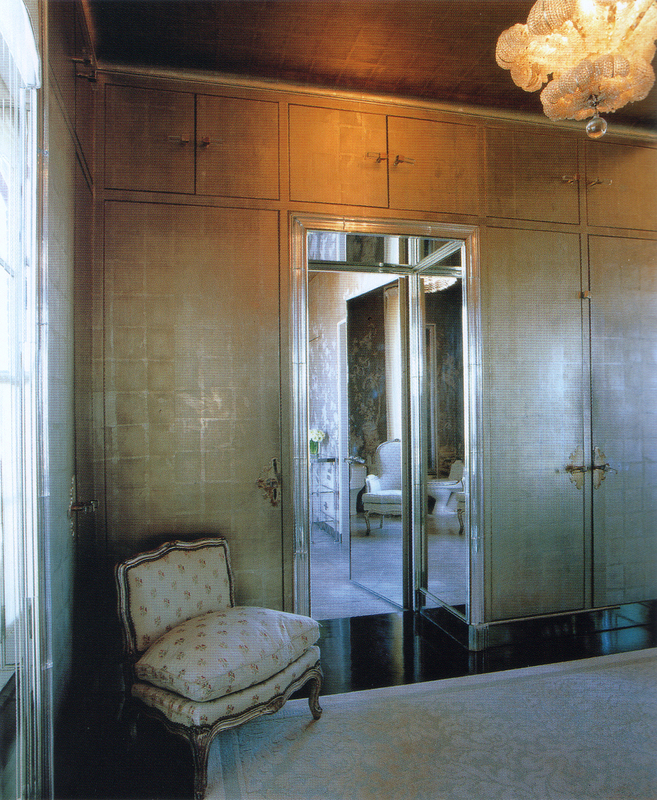 Here, in the dressing room, all the surfaces, except the floor, were mirrored or papered in matte silver, streamlining the many recessed doors opening into the built-in closets. Bolection molding in Steuben glass outlined the room’s principal doorways, window, and mirrored niche containing the built-in dressing table and its Queen Anne-Venetian-style mirror. (above) The other end of the Zellerbach dressing room. The mirrored door and doorway lead to the bathroom. The pièce de résistance is the custom Venetian-glass chandelier in the form of a large flower head. Details, such as the closet doors’ hardware, fascinate me. I wonder if the escutcheon plates were custom ordered, but the book does not give us the answer. (above) The outcome of all Frances Elkins’ influences, resulted in this recessed mirrored niche, combining a shaped vanity with a simplified Queen Anne-style mirror. On either side of the arch portion of the mirror are two panels that open to reveal medicine cabinets. Even though this space is not nearly as sumptuous as in Frances Elkins’ designs, my vanity space is very precious to me, and I feel very lucky to have it.